Our property is conveniently located less than two miles from every kid’s favorite place to visit in the Mount Washington Valley – magical Story Land. Upon checking into the Golden Apple Inn, you will receive your Story Land passes allowing you and your family to immediately begin enjoying a fun filled day of rides, live shows, storybook characters and memorable experiences. Avoid waiting in those long ticket lines and start exploring the place “Where Fantasy Lives”! After your park adventure comes to an end, our brand new playground area and beautiful swimming pool offer the perfect setting to cool off, unwind and relax. 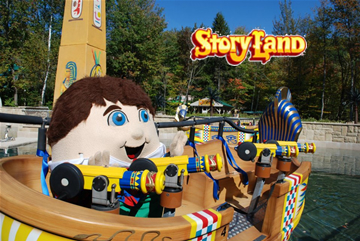 Packages are based on a two night stay and four general admission tickets to Story Land. Prices do not include 9% NH lodging tax.